THE ALBUM ART is intriguing, only subtly hinting at the extended explorations contained within. 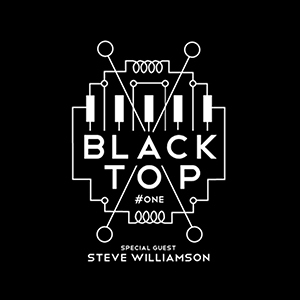 Recorded live at the creative crucible that is Jazz in the Round (curated by BBC Jazz on 3’s Jez Nelson at The Cockpit Theatre, London), duo Black Top collaborate with saxophonist Steve Williamson to produce an absorbing free jazz experience. Former Jazz Warriors Pat Thomas (piano, keyboards and electronics) and Orphy Robinson (marimba, vibes, steel pan, trumpet and electronics) have, over the past three years, been experimenting with live instruments and lo-fi technology, inviting jazz ‘royalty’ such as Shabaka Hutchings, Jason Yarde and Claude Deppa to guest with them to create a diversity of improvised trio sets. For this performance and subsequent debut release (recorded in January 2012), they welcomed back acclaimed saxophonist Steve Williamson, together setting up these excitingly original, live soundscapes. The album’s three tracks cover a spectrum of musical textures and shifting atmospheres, referencing New York’s ‘Loft Scene’ avant-gardism of the 1970s as well as revealing Afro-Caribbean influences and dance rhythms. Piano, marimba and saxes take centre stage, but Black Top also infuse their evident virtuosity with a plenitude of beats, samples, loops and effects. Opener There Goes the Neighbourhood! meanders to the unadorned sounds of tenor sax, marimba and piano, the three players spontaneously developing their shared ideas with increasing complexity, intermittently augmented by pounding electronic dubstep patterns and oscillations. The gradually-changing marimba ostinatos are, unsurprisingly, redolent of Steve Reich, Thomas’s full piano stabs adding to the hypnotic pulse and Williamson’s tenor melodically soaring above. At almost 24 minutes in length, Guess Who’s Coming to Dinner provides a central focus. The deep, hollow voice of the marimba possesses a strong personality, Robinson building its sustained, edgy mystery towards a repeated phrase on which Thomas lavishes a brash and richly percussive Cuban-style piano display, jabbing and rolling across the entire keyboard. Crunchy tenor heightens the excitement, Williamson blasting and scurrying to the concurrent fever. This expansive journey is initially indeterminate and unpredictable, yet the familiarity of repeated listenings remains just as compelling, the trance-like effect of spiralling soprano sax, rapid marimba, fuzzed electronics, jagged piano and thudding rhythm impressively gripping – and then a palpable calmness when it briefly dies back to more spacial cerebration. The closing section finds Williamson’s soprano sneering broadly at the keys, though piano and marimba are up for the challenge with the same tumultuous intensity… and appearing unresolved at the close! Archaic Nubian Stepdub throws electronics to the fore in this funkier and more succinct closing track, its perpetual-though-shifting rhythms encouraging Williamson to reciprocate with similarly loop-mimicked soprano sax. One of Babel Label’s 20th anniversary releases for 2014, the exhilarant rhythms and open environments of #ONE are capable of prompting an almost interactive listener response, such is their power to move. To sample and purchase, visit Babel’s website/Bandcamp store – and catch a great video excerpt of the gig here.